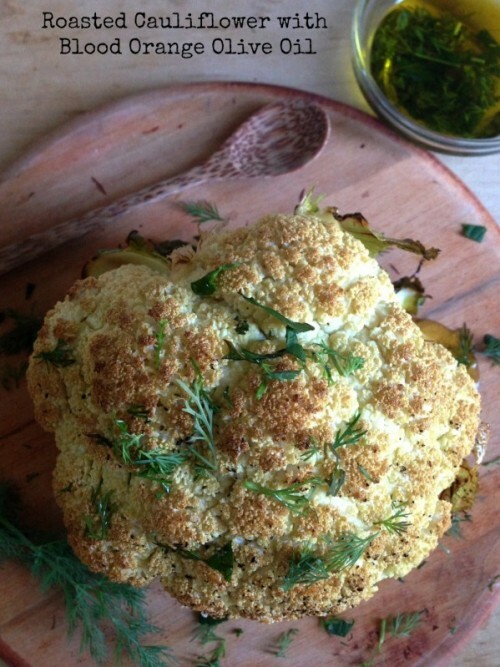 Roasted cauliflower is the perfect addition to your holiday appetizer tray. I used a blood orange flavored olive oil, but a premium extra virgin olive oil works just as well. I just wanted that extra kick and flavor boost for this appetizer to awaken your taste buds! Serve the entire head on the board with a small paring knife, and have your guests pull it apart. Serve on a larger board with cheeses, nuts, dried fruit and bread. This also makes a great side dish for any of your main dishes. Add this simple and quick dish to your Meatless Monday meal, your family will love the nutty flavor from this delicious roasting technique. Here’s the recipe, so simple! Clean the cauliflower head by cutting away any dead leaves. Preheat the oven to 350 degrees. Place on a sheet tray and sprinkle entire head with olive oil of your choice. Place in the oven and roast for 30-45 mintues roast until tender. (Check with a skewer or sharp knife tip). Sprinkle with fresh herbs, I used dill and parsley. Make the dip by using 1/4 cup blood orange olive oil with 1/4 cup apple-cider vinegar. Add chopped herbs, salt and pepper. Whisk together. (If using a non-flavored olive oil you may also use sherry or red wine vinegar. Serve dip alongside the cauliflower alone, or on a cheese board with nuts, dried fruit, and bread. 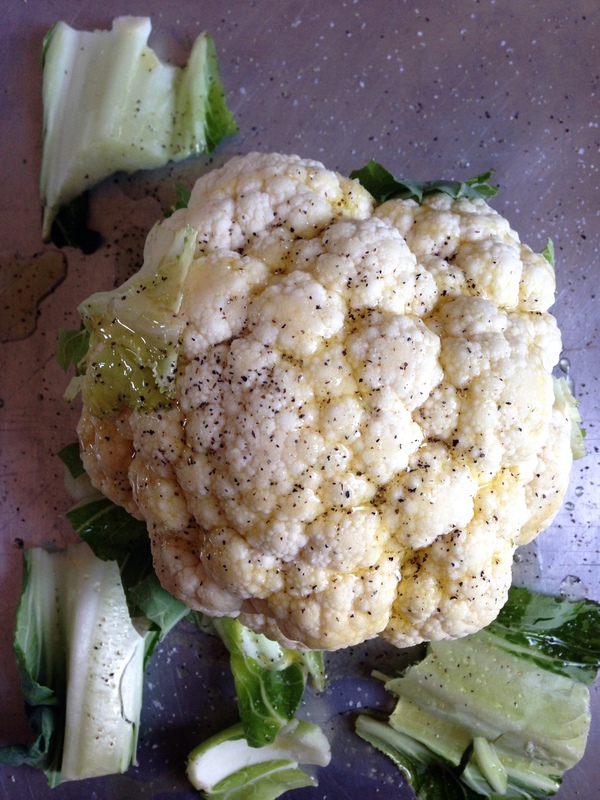 Note – The cauliflower can be roasted the day ahead and reheated before serving. This can also be served at room temperature. Flavored extra-virgin olive oil can be found at your local fine gourmet stores, or online. I found mine at Temecula Olive Oil Company. © 2013 – 2014, Mary Papoulias-Platis. All rights reserved. I never thought of roasting a whole cauliflower. Love this. So elegant, and such a nice alternative to the usual appetizers! Barbara, we do this quite often in the Greek cuisine, cauliflower plays a big role in our diet. So we have many uses for it. I hope you enjoy it!